My husband and I decided to get a baby travel crib to use as a baby crib for Lukas’s first few months. Our apartment is not very large, and a travel crib has a lot of advantages: Firstly, it doesn’t take up much space. Secondly, you can push it around from room to room. 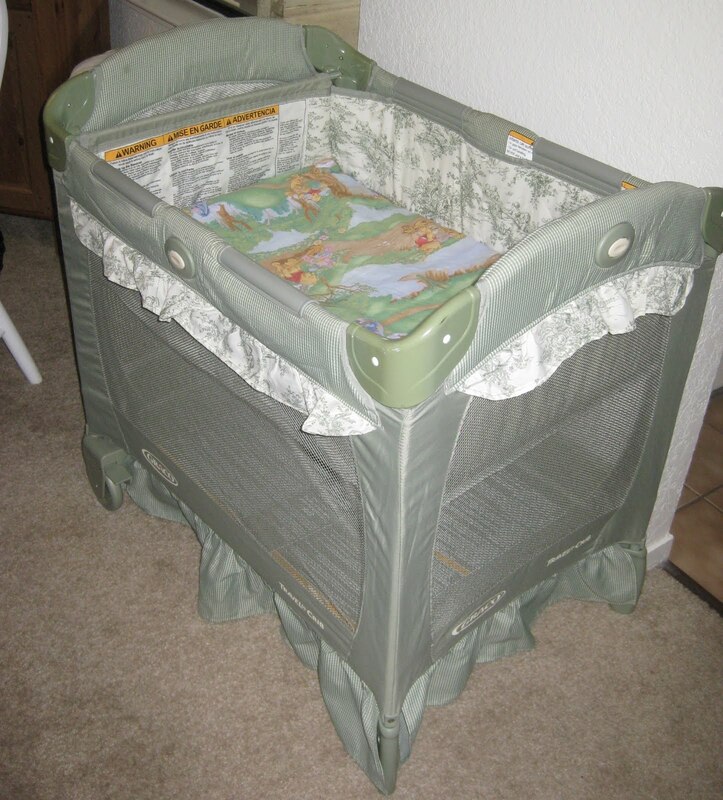 Thirdly, it is much cheaper than a brand new bassinet/crib. And, finally, it’s high enough that our 19 month old can’t reach well into it. The one disadvantage? The mattress was very hard and sunk in a bit in the middle. The solution ended up being a combination of flattening out the bed by adding a piece of cardboard and a blanket under the mattress and adding a mattress cover. The problem was only that they don’t make mattress covers for baby travel cribs. Therefore, I decided to sew one up myself. 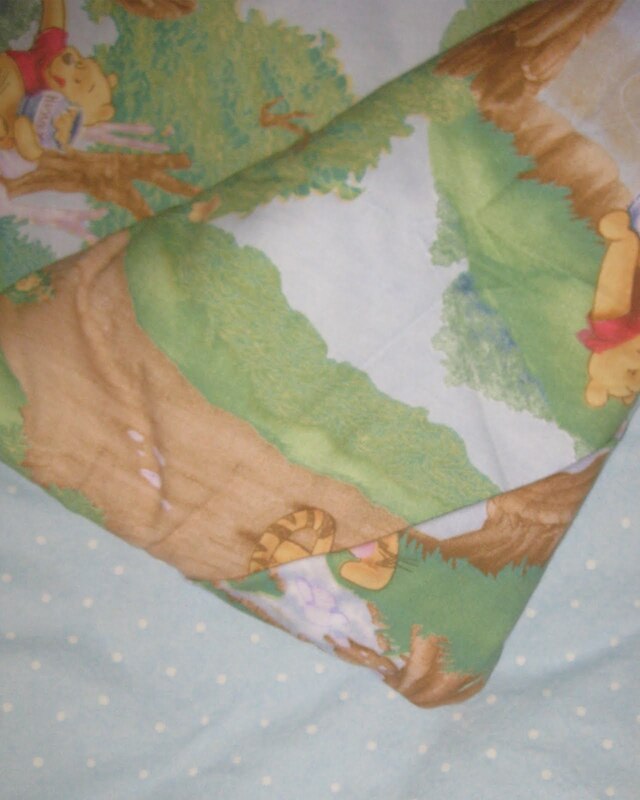 I decided to use a similar concept to the baby pillows that I made for Jonas. They have just enough fluff to be comfortable, but are flat enough to be safe. I also added some fold over corners to the cover so that it would stay on the mattress, another safety guard. I think the resulting cover is so cute, it is really a shame that you have to put a sheet over it. Maybe, when he’s a bit older, I’ll just leave it in the bottom of the playpen. 1. 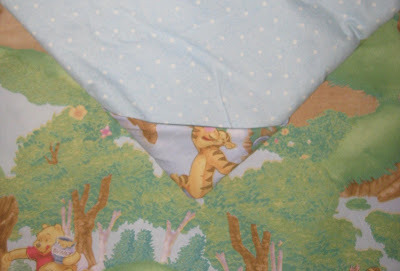 Measure your playpen/travel bed so that you know how big to make your mattress cover. Then cut out 2 pieces of material, plus 2 pieces of thin polyester backing adding a half inch to each side. 2. Now cut out 4 square pieces of material, about 8 x 8 inches. Fold material in half with the nice side on the outside. 3. Lay down the pieces as follows: First one piece of material with the good side facing up. Now add the triangles to each corner, so that the two open ends of the triangle are facing the corner. Then, add your next piece of material with the good side facing down. Finally, lay the polyester backing down on top. If you have difficulties sewing over polyester backing, add a layer of newspaper to this, which you can tear off later. Add stick pins around the entire square to hold. 4. Leaving about a half inch all the way around, sew around the rectangle until you are about 4-6 inches from where you started. Now turn the entire piece inside out, so that the right side of the material is now on the outside, and the polyester backing on the inside. You will see that the triangles can be folded to either side. 5. Finally, sew up the remaining 4-6 inches by hand and you are finished. When I added this mattress pad to our crib, my baby finally slept “like a baby.” If you need a temporary crib or travel a lot, consider making your own mattress pad. You are so creative!! I LOVE it! I always admired how artsy you were in high school and it is so fun to get to see how you are using your talents now! Great article or also thanks for your sharing.